How do you deal with stress? That’s the magic question isn’t it? We all have stress. 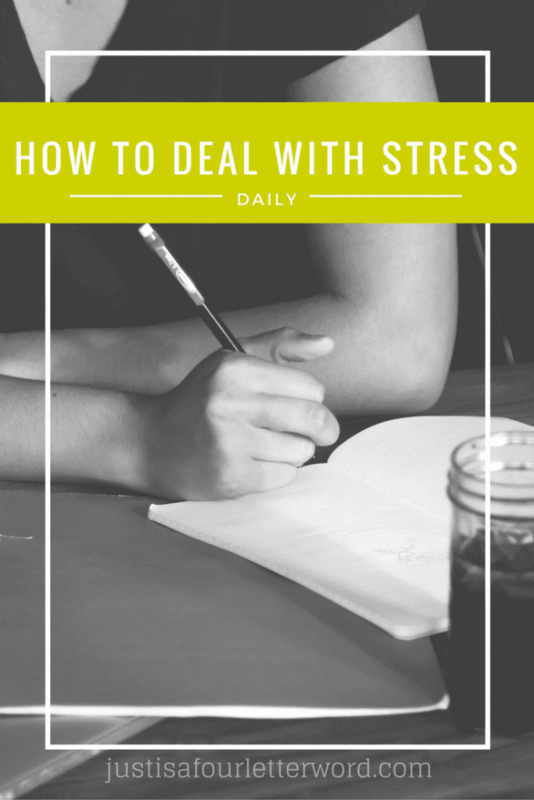 None of us really wants to be stressed, yet sometimes it’s just unavoidable. I definitely admit to googling how to deal with stress a time or two in life. And if Google can’t help, well…I guess there’s no hope. Actually, there are a lot of scientific ways to deal with stress. Things like sleeping and eating right and exercise. All of these activities improve the body, which in turn improves the mind. It’s like a little nod and a handshake between the two. A sort of you scratch my back and I’ll keep you from losing your sh*t kind of thing. Synergy. Or something. But I will tell you this, when I reach that place where I am desperate enough to start googling for answers, what I really want is someone to tell me their own story. So that’s what I am going to do. I have joked many times over the years that I actually thrive on stress. I have two speeds and they are stop and GO AS FAST AS I CAN. I’m either on vacation or off to the races or so it seems. It’s been like this as long as I can remember honestly. Even as a kid growing up, I would procrastinate until the very last minute and then work non-stop to finish. Some might call it poor planning, I just knew it as a way of life. Like my straight hair that turned insanely curly as a teen and back to straight after having kids, I learned that it’s best to find a way to work with the process rather than fight it. What that means for me is to know when I am my most productive self. Many people say we all need to slow down to get the most out of life and be our best selves. With this I both agree and disagree because I think it needs a little more detail. Moving slowly isn’t helpful when you aren’t doing what needs to be done. The secret is choosing what actually needs to be done and why. One of my biggest weapons against stress is being aware. I know I can’t control every situation. That’s a given. But I can be aware of my surroundings, love my family and know my status. I write a lot of things down when I am feeling lost because seeing it on paper instead of floating around in my subconscious brings me back into reality. I’ve been making lists for almost my entire life. 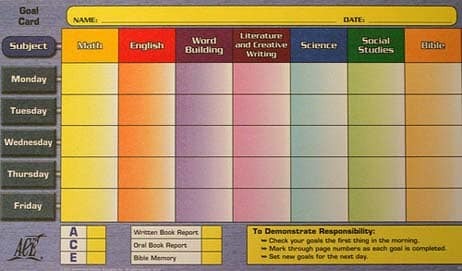 As a home-schooled student growing up, I was responsible for setting my own weekly goals and completing them. For this, I used a “goal card” similar to the one above and it was exactly what it sounds like. I would set daily goals and cross off each task as I did it. Doing so gave me a visual reward for my hard work. Likewise, seeing the uncompleted squares motivated me to keep going. When I slacked off, I paid the price by working all day Thursday into the night and Friday. Not fun. Negative consequences helped teach me how to deal with stress in more productive ways. But you can’t be aware of your progress if you don’t know where you are going. All the lists in the world won’t help with stress if you don’t have goals. A huge part of dealing with stress for me is understanding why I am doing things. Even mundane daily tasks usually have a why behind them if we look hard enough. When I set goals, I accomplish two things. First, I know where I am going. I may need to do a certain amount of work to get a paycheck or take a vacation. Or maybe my kids need to have a certain shirt for field trip day. Setting goals (long-term and weekly) gives me direction. Secondly, goals help me find my why. If I am faced with the task of listing out what needs to be done for the week, I must decide if what I am doing is worth my time. I have to think of the why behind each task and once I identify it, I usually have an easier time getting it done. Because then it’s “make sure Calvin is prepared for a great field trip because right now I can help make school fun” and not simply “do yet ANOTHER load of laundry because sure I have plenty of time for that”. Maybe it’s a mind game, but it really works. I mentioned thriving on stress earlier and I want to dig in to that a little more. It’s December 2nd and we are right in the middle of the vacation sandwich. I wrote about it in this week’s newsletter (Subscribe! It’s free!) because this is me being aware. We’ll be traveling for the last half of the month, which means I need to be on my A-game until then. Next to me, I have my monthly goals, a breakdown by personal and professional deadlines and appointments and a daily list of how I am going to tackle them all. Until I did that, I was pretty stressed out. But now that I can see everything broken down into daily tasks, I feel excited to see what I am capable of. This is doing the thing. Stress comes from overthinking so much of the time and the best way to fight it is to start doing. To be clear, that doesn’t mean just stay busy. It means being intentional about what we do and when we do it. That’s how you open up to the mindset of sleeping more and eating right because you no longer feel like you don’t have time for those things. In turn, that mind-body handshake can happen and everybody wins. This is why the daily goals are so important. Just like meals and sleep, too much of a good thing all at once is not good for us. Breaking our goals into smaller daily “meals” gives us what we need at a manageable pace. It’s easy to talk about stretching and meditation and coping strategies when it comes to stress. But finding the source of the stress and dealing with it has made all the difference for me both at home and professionally. How do you deal with stress? I’d love to heard your tips in the comments!